Sweet Tarragon (Tagedes lucida) flowers provide wonderful vivid colour in the garden, and a taste treat of leaves and flowers. 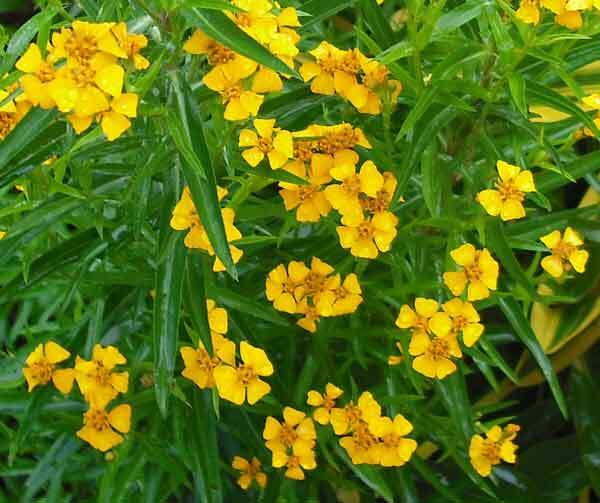 Sweet tarragon is related to French tarragon, with both herbs belonging to the Asteracea family. While French tarragon is a very traditional flavouring herb in white sauce to serve over chicken and beef, and also mixed with butter to have on vegetables, the sweet tarragon which is much easier to grow, can be used similarly. Nibble on sweet tarragon leaves and flowers when tempted to snack on chocolates, and try chopped leaves sprinkled over breakfast cereal. Sweet tarragon leaves, in a fruit salad, become a wonderful taste sensation; or chop finely and add to whipped cream. Leaves of sweet tarragon make a stimulating and enjoyable tea. Freeze sweet tarragon leaves and the bright yellow flowers in ice cubes trays with water for an interesting flavour in cold drinks. Tarragon is an essential ingredient in sauces, such as bernaise, hollandaise and tartare, and is also an essential ingredient in anchovy sauce. 24 fillets unsalted anchovies (if salted, soak overnight in milk) 2 tablesp. olive oil 1 level tablesp. plain flour 250g butter 2 tablesp. fresh chopped tarragon. Wash anchovies in cold water. Mash them with a mortar and pestle; slowly add olive oil. Melt butter, sprinkle flour on top and cook until golden. Slowly add the anchovies. Remove from the heat, blend to a smooth paste and add the chopped tarragon. Serve over grilled fish, barbecued steaks or fillets of fried chicken.